As the 2 seed last year Villanova failed to make the Sweet 16. This year, a better team and a 1 seed, the Wildcats will look to make a Final Four run, but will most likely have to face a Rick Pitino led Louisville team in the Elite 8 to get there. Nova has not lost since January 19th, and has 8 wins against tournament teams since then. The 4 seed Cardinals are a dominate defensive sqaud that allow less than 60 points per game and feature a potential 1st round draft pick in this years NBA Draft in Montrezl Harrell. 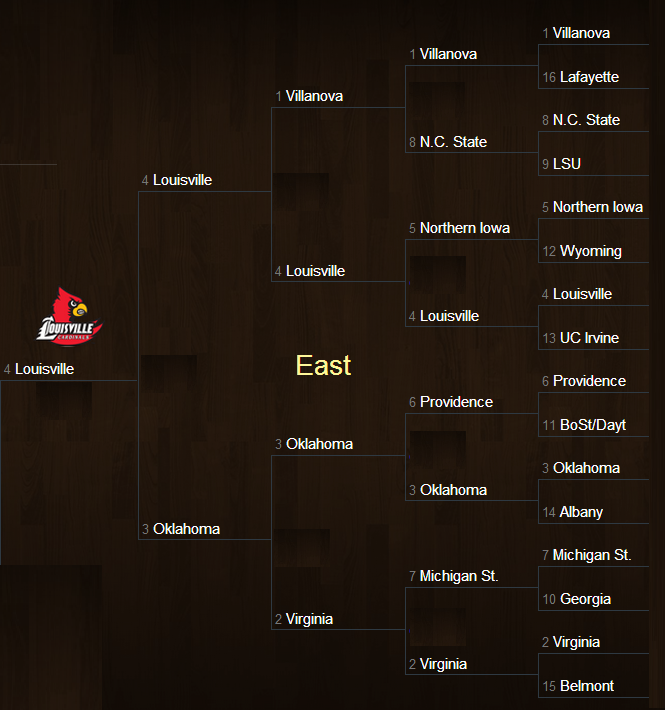 Louisville will have to get past Northern Iowa in the Round of 32, which will not be an easy task. Like UL, UNI plays stout defense allowing just 54 points per game, but they do play in the Missouri Valley Conference. One thing they do not do well is rebound, and that is how Lousiville will beat them, cleaning up the glass on both ends of the floor. On the bottom half of the East bracket, Virginia is the 2 seed and will have to get by 7 seed Michigan State and 3 seed Oklahoma to play in the Elite 8. Continuing with the theme of defense in the East Region, UVA held opponents to just 50 points per game, leading the nation. The Cavaliers lost 2 of their last 3 games heading into March Madness, including in the ACC tournament to the North Carolina Tar Heels. They also lost to Lousiville, 59-57 on March 7th. For the Sooners to make an Elite 8 appearance, they will have to rely on guards Buddy Hield and Isaiah Cousins to break down Virginia’s defense, and knock down their 3s. Oh, and they play great defense as well, limiting opponents to just 63 points per game, however they are inconsistent. This region is filled with defensive teams, so the teams that have legit scoring threats are going to win. Nova and Virginia lack that killer instinct and I see Rick Pitino making another Final Four appearance. The majority of brackets feature (1) Villanova and (2) Virginia in the Elite 8 but as I mentioned before, the lack of a go to player on offensive will make that a difficult task for either team.